Brainerd (Minn.) High School Head Coach Ron Stolski has been named the winner of the 2005 Power of Influence Award. Stolski was nominated for the award by the Minnesota High School Football Coaches Association. The award, which is presented jointly by the American Football Coaches Association and the American Football Coaches Foundation®, will be presented to Stolski at the AFCA Coach of the Year Dinner on January 10 at the 2006 AFCA Convention in Dallas, Texas. Stolski will also receive a $1,000 stipend from the AFCF. Stolski has been a head football coach in Minnesota high schools for 44 years, and is currently in his 31st year as the head coach at Brainerd High School in Brainerd, Minn. He has a career record of 280-132-5 in his first 43 years, with 14 conference championships and five trips to the state playoffs. With his 280 wins, Stolski is currently Minnesota's winningest active coach in Class 5A. He is currently a member of five Halls of Fame, including the Minnesota State Athletic Directors, Macalester College, Park Center High School, Patrick Henry High School and Brainerd High School Halls of Fame. Stolski's passion for football can be found all over the state of Minnesota. He co-authored the Minnesota high school football playoff structure, which began in 1982. Stolski also began the Brainerd Coaching Clinic in 1975, which has been described as, "the original high school coaches clinic for high school coaches by high school coaches." 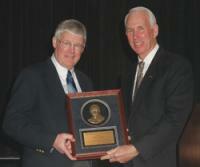 He founded the Minnesota State Athletic Directors Hall of Fame and the Minnesota Salute to Co-curricular Activities. Stolski speaks at many seminars and conferences in the state of Minnesota and across the nation, and is a frequent contributor to various publications, including the National Federation News. Stolski is a past president and was recently selected as the first-ever Executive Director of the Minnesota High School Football Coaches Association. He has served on numerous committees for the MHSFCA, along with working with organizations at the national level. Stolski was a member of the National Federation Athletic Directors Advisory Committee from 1988-1991 and the National Federation Sportsmanship, Ethics and Integrity Committee from 1989-1992. He has won numerous awards over the years, including being named the Nike Minnesota Athletic Director of the Year in 1997 and a recipient of the National Federation Citation in 1988. The other finalists for this year's award were: Jim Bradley, Mayfield High School (Las Cruces, N.M.); Maurice Fitzgerald, Pearl-Cohn High School (Nashville, Tenn.); Don Lessner, Mason High School (Erie, Michigan); Frank McClellan, Barton High School (Barton, Ark. ); John Nyhaug, Viborg High School (Viborg, S.D. ); Hugh Sandifer, Wylie High School (Abilene, Tex. ); Rollins Stallworth, Proctor R. Hug High School (Reno, Nev.); Brent Steuerwald, Shenendehowa High School (Clifton Park, N.Y.); Perry Thomas, Tilghman High School (Paducah, Ky.); Rob Younger, Sweet Home High School (Sweet Home, Ore.). The first Power of Influence Award was presented in 2002 when Amarillo (Texas) High School's Larry Dippel was named the inaugural winner. Other past winners include John McKissick, Summerville (S.C.) High School (2003), and Marcus Borden, East Brunswick (N.J.) High School (2004).